Every once in a while there are apps that take an existing problem or function and make them better by elevating the process and cleaning up the design. When apps are simple yet elegant and streamlined they lend themselves to a better user experience and overall appeal. Every once in a while there are apps that take an existing problem or function and make them better by elevating the process and cleaning up the design. When apps are simple yet elegant and streamlined they lend themselves to a better user experience and overall appeal. This is very much how Apple has functioned over the years, and it has served them well. 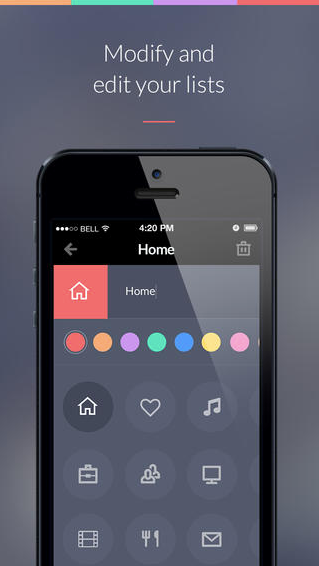 Simple doesn’t necessarily mean void of features and usefulness–just the opposite. More often than not, simpler means an intuitive and visually appealing design, and this is where Taasky shines, and for only $1.99. Taasky does only a few things, but does it really well–and looks great doing it! That’s it. Taasky doesn’t try and do everything for you. 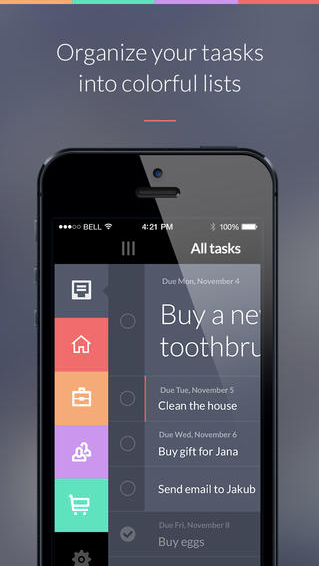 It takes the task of creating to-do lists and makes it fun, easy and appealing. To create a new list, you simply swipe down. You change between lists by swiping to the right. A swipe to the left will allow you to edit tasks, and selecting and holding a task will let you change its priority in your list. There is an in-app purchase available for $0.99 that enables statistics so you can track your success completing tasks over a day, week or month. Well worth the upgrade in my opinion.